The granola section in many grocery stores is starting to look like the cereal aisle of a Grand Union circa 1980 but instead of cereal, the shelves are filled with every type of granola known to mankind. Most people are thrilled with all the new choices of this traditional breakfast food though there are some naysayers who claim the last thing we need is another artisan granola. Not so and I’ll tell you why. Granola is not universally the same thing. One of the defining characteristics of granola is the variety and amount of ingredient options. Nearly every granola has a foundation in rolled oats and a sweetener (preferably maple syrup or honey) to which a variety of dried fruits, nuts, seeds, grains, spices, and a bit of oil are added. 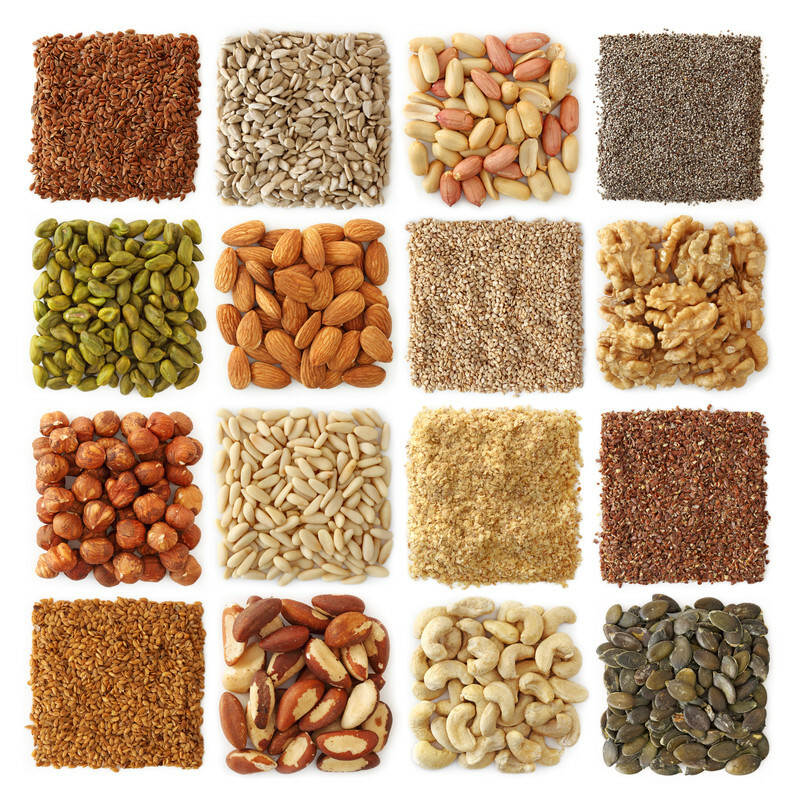 The combinations are virtually endless which means the flavors vary greatly among granolas. Some are nuttier, fruitier, sweeter, and spicier but a common characteristic of every good granola is texture. Granola has to be crunchy (although it can be chewy, too) which is achieved by thoroughly roasting the mixture to ensure a crunchy bite every time. Under bake granola and risk having a dry, dusty and soggy bowl of mush when your milk of choice is added. Granola is a universally loved food that is enjoyed as a breakfast and snack food but nobody wants to eat the same thing every single day (which is why there are as many varieties of granola as there are cereals) which is good news for granola makers (and one of the reasons we see more grocery aisle space devoted to granola). When a new granola hits the market, there’s a sense of excitement that maybe, just maybe the new kid in town will have something that the others don’t. And, so we read the label of ingredients and if there are no offensive ingredients like refined sugar, high fructose corn syrup, artificial colors and flavors, or preservatives, then we put the granola in the grocery cart to enjoy at home. 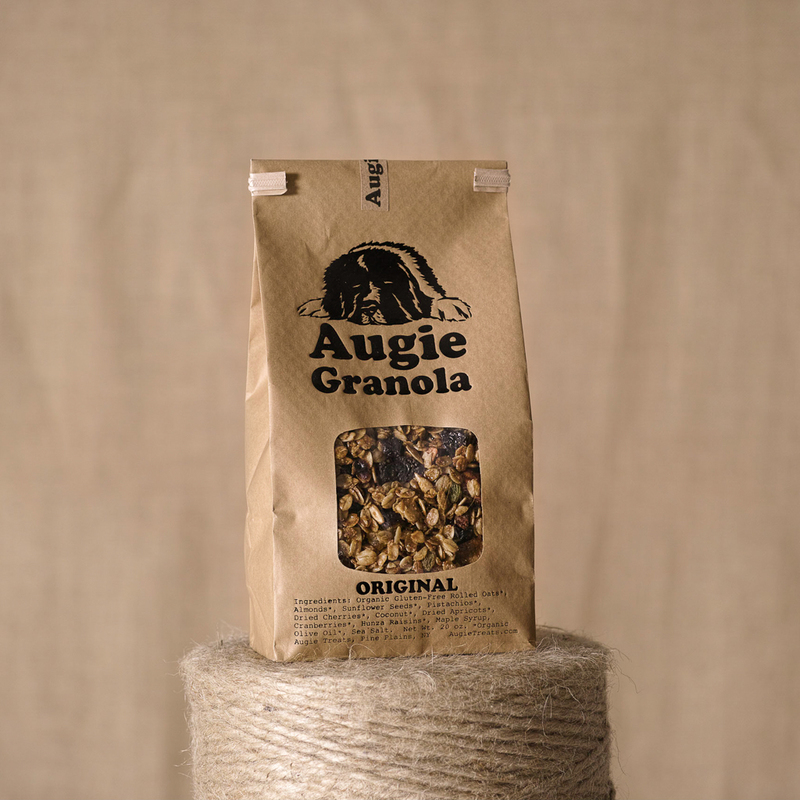 One of the most incredible artisan granolas on the market is Augie Granola made by Augie Treats, a company based out of Pine Plains, New York – a small town in the Hudson Valley a few hours north of New York City. Nancy Booke is the chef extraordinaire who makes Augie Granola (named after Augie, her Newfoundland dog) by hand, using a wide variety of mostly organic ingredients (everything except the maple syrup) to ensure every bite has a cornucopia of flavors. 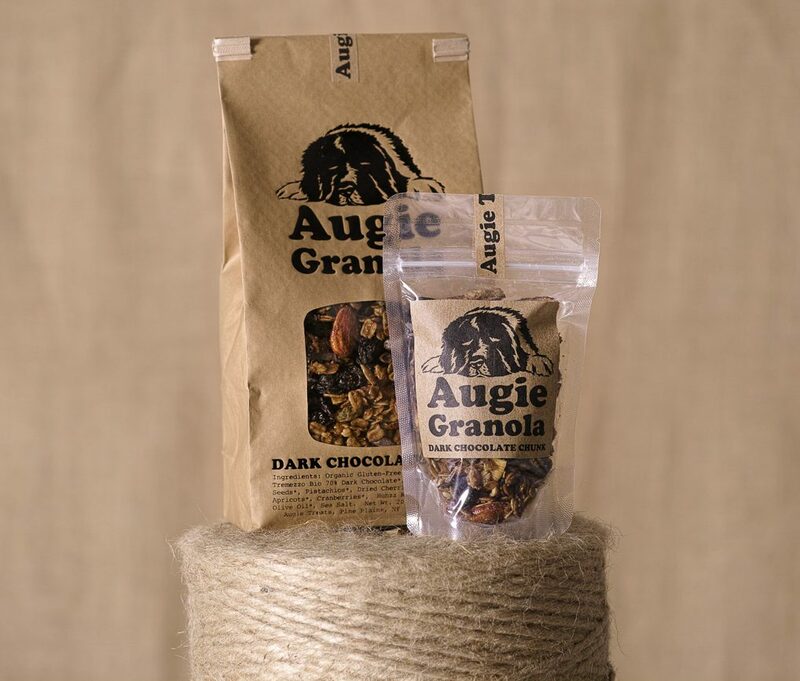 Loaded with a 8-11 types of organic nuts, seeds, and dried fruits, Augie Granola is both very crunchy and very chewy and very delicious. Original: Made with organic gluten-free rolled oats, organic almonds, organic sunflower seeds, organic pistachios, organic dried cherries, organic coconut, organic dried apricots, organic cranberries, organic raisins, maple syrup, organic olive oil, and sea salt (naturally organic). Dark Chocolate Chunk: Made with organic gluten-free rolled oats, Tremezzo Bio Organic 70% Dark Chocolate, organic almonds, organic sunflower seeds, organic pistachios, organic dried cherries, organic coconut, organic dried apricots, organic cranberries, organic raisins, maple syrup, organic olive oil, and sea salt (naturally organic). Sunny Day: Made with organic gluten-free rolled oats, organic pecans, organic pistachios, organic sunflower seeds, organic coconut, organic California figs, organic Mission figs, organic Angelino plums, organic apricots, organic Hunza raisins, organic gooseberries, organic bananas, maple syrup, organic olive oil, and sea salt (naturally organic). 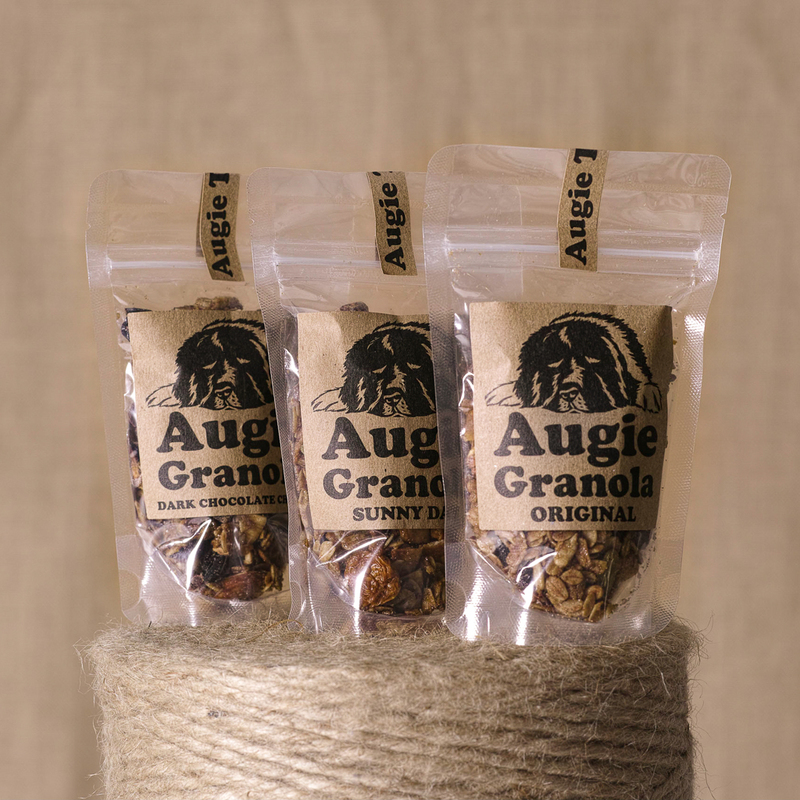 Each bite of Augie Granola is crunchy, chewy, oaty, nutty, fruity, and delicious. A 20-ounce bag (which is larger than most granola packets) sells for $13 – $15.75 ($0.65 – $0.79 per ounce or the equivalent of $7.80 – $9.48 for a 12-ounce packet), depending on the flavor. 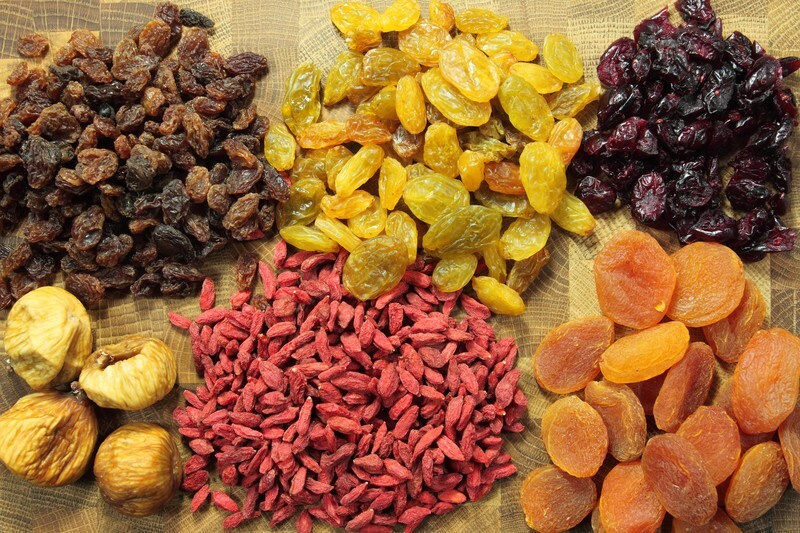 You won’t find a better granola made with such high quality ingredients. 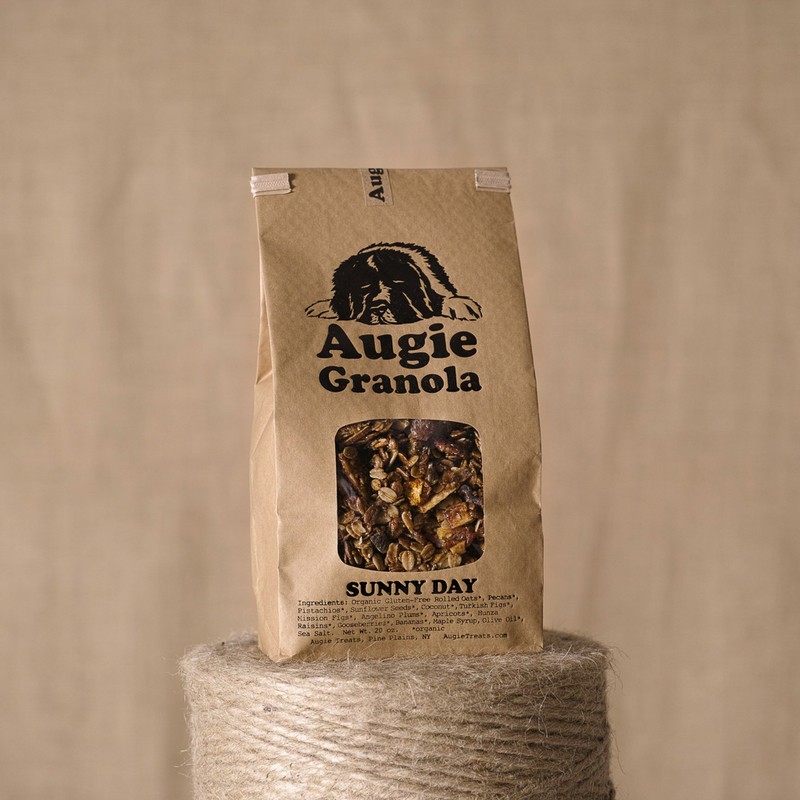 Simply stated, Augie Granola is in a league of its own. Purchase on-line directly from Augie Treats (www.augietreats.com). Shipping is free with monthly subscriptions. 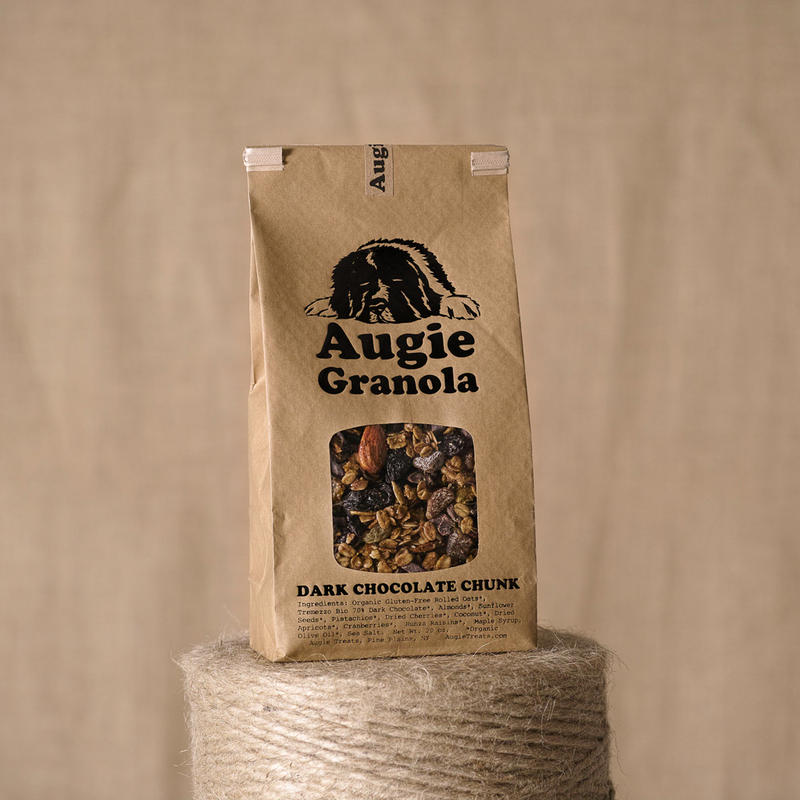 Augie Granola can also be purchased in select stores in New York, Massachusetts, Vermont, Illinois, Texas, and Arkansas. Click here to see a list of retailers.